Kubuntu live CD version 20060518. There is a folder link on desktop called Examples. As this is regular symlink, it cannot be translated. It should be changed into ".desktop"-style link and translation of this desktop file should be put in Rosetta to allow full translation of desktop for other locale than English. example-content binary package just installs /etc/skel/ file, which gets installed on users's home folders. The link on the Live CD is created by casper, which does mv /root/home/$USERNAME/Examples /root/home/$USERNAME/Desktop/. Casper would also thus need updating if this change is done. Still a problem in Ubuntu 7.04, current daily builds. And gutsy too. This bug covers also the same link put into each user's home folder by default. The xdg-user-dirs should take care of the other folders in Home, but not this. Still a problem in hardy heron. The "cheating" part being that we're claiming it to be an application, though it's actually just a link to a folder that opens with whatever the desktop's default file browser is (of course, assuming it follows both the Desktop Entry specification and the File URI specification, which I believe to be rather universal today [please correct me if I'm wrong]). For CLI users this may look a tad bit odd ("huh, that thing's a .desktop file? "), but when they open it up in their editor they'll instantly realize what's going on. for people who do not know English. It is a bug. The reason for not fixing it is probably that no-one really actively maintains the package from what I've followed. Ie. it's no-one's clear responsibility. It would help if someone would create a bazaar branch completely done, ready for merging... something that would fix both the live-CD icon, shown on the desktop, and the after-installation link from Home folder. This is indeed a bit nasty/ugly i18n problem, since it's relatively visible (even if ignoring the installation phase, it's placed on the Home folder of each user on every install). I started something yesterday evening. If I have some free time today after work I will try to finish it, since theoretically it seemed to work but needs some more stuff to be corrected. Actually example-content package is only responsible for the home folder link after installation, I guess the link on the live-CD comes from somewhere else. But the home folder link is the most important. The ~timo-jyrinki/example-content/folder_i18n branch changes the Examples link into an examples.desktop file, which is of type Link and points to the folder. It uses gettext to get translations on-the-fly from langpacks, therefore fixing the bug #45489 for the case of after-installation for every Ubuntu user's home folder. The link on the Live-CD desktop probably comes from elsewhere. At the same time, some of the content was moved around. The python usage here is a bit of an overkill, but it was the way I (thought I) knew how to make this work. The only hack needed was for installing the .desktop file under /etc while still using cdbs defaults otherwise. It's lintian clean and tested with pbuilder, and seems to work fine. I'm attaching a screenshot to the bug report of a situation where the examples.desktop is installed in /etc/skel (without translations), .mo files are in locale directories, a new user has been created and it has been logged in for the first time. I didn't use Icon=Folder, since it's actually after the ordinary folders and the icon in my opinion confused the user. So it's just the default link icon, which I'd prefer over also a folder icon with a link arrow on it since it looks wrong in the alphabetical order if it looks like a folder but is after other folders in the list. I forgot to mention that naturally Python is only used during building, there are no dependencies of any kind in the binary package. But isn't all the content in the folder in English anyway? People can understand images, sound, video similar to what's on the web, independent if they are fluent in the language of the material. But having an item in one's home folder in a foreign language, in the middle of all the familiar names in a localized user interface stands out as being unprofessional. It's similar to any piece of highly visible non-translated string in Ubuntu - since Ubuntu is so well I18N:d otherwise, a single very visible item stands out as ugly or unprofessional. 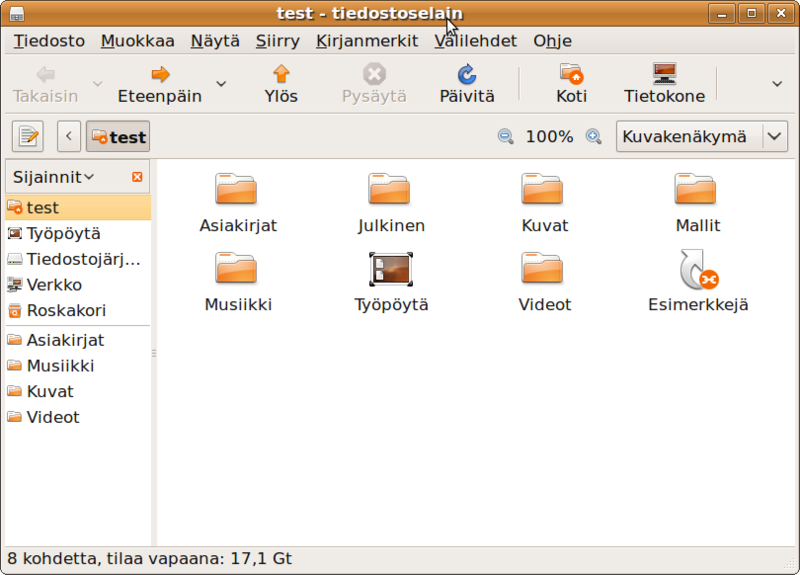 And I have probably heard about every I18N problem I have pursued from users multiple times, live or on the web, like "Ubuntu is quite nice and very usable in Finnish... but there is this English menu entry which my dad was confused about" etc. Removed my assignment from the task and the "In Progress" status, since I can't anyway do any uploads so they probably shouldn't be used. Uploaded and sitting in the archive admin queue. - Also disable PulseAudio for the Braille profile. - Fix incorrect paths when chowning files. where the installed system is located. packages are installed on the live filesystem and installed system. * ubiquity-hooks/30accessibility: Copy orca settings to the installed system.